Is It Good? Lobo #1 Review – AiPT! The main man is back. Lobo has already been featured in the New 52, most recently in Justice League United, but Lobo kicks off the debut of his solo series in style. 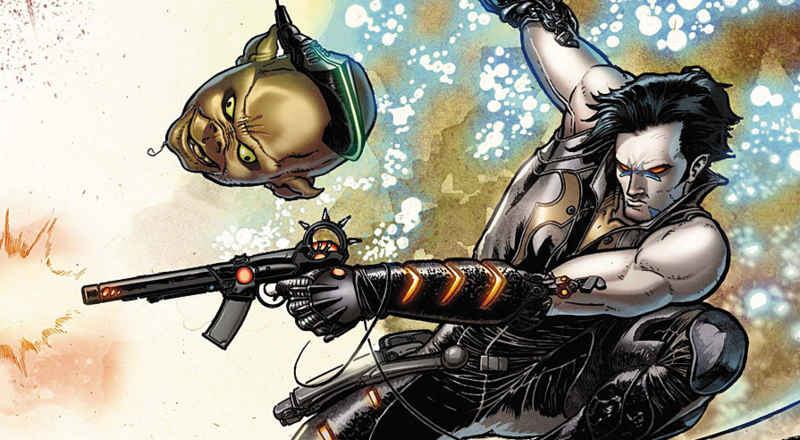 Cullen Bunn, who is not exactly unfamiliar with villain solo series, (he also wrote for Sinestro) is backed by penciller Reilly Brown and inker Nelson Decastro to help usher in a new vision for Lobo’s character. How does this skinny hip Lobo compare to the comedic hulk in the past… and is it good? This is not your parents’ Lobo. Well, considering most parents don’t know about the bastich — it’s not the Lobo you’re used to seeing. This issue requires a fresh pair of lenses as it’s completely independent from the classic Lobo version we’ve seen in the past. This Lobo appears younger, more physically attractive, suave, bears a traumatic romantic experience, carries personal baggage of a complicated past, and doesn’t share the same vulgar paradoxical humor as the Lobo. That’s all I will say in regards to comparing the two versions of Lobo because it’s like comparing Brad Pitt to Larry the Cable Guy — they’re two distinctly different people (yeah, the analogy isn’t the best, but it delivers the appropriate message). And when I say two distinct people I mean they’re literally two different people which you’ll experience first-hand in the opening pages. The issue begins with Bunn making a statement towards the controversy of having two different Lobos and why the story surrounds this new Hot Topic Lobo (that’s the last time I make fun of this alternative look, I promise). Spoiler: Apparently the two Lobos have some beef over something that went down in Czarnia, their home planet. In older versions, Lobo destroyed the planet, but we’ll see if that holds up in the New 52. After our new Lobo beheads the old, he experiences nightmares which feature Czarnia, a lover, and the destruction of the planet as a whole. It’s made clear that this Lobo will be the only version featured and we get a glimpse of his past and what his role is before being thrown into the premise for the first story arc. Lobo is approached in jail and offered bail and payment to hunt down some of the deadliest and most colorful assassins in the universe. The assassins are all converging on a planet to take out the same target and a client is willing to pay out to attempt to stop it. Lobo accepts the job and immediately heads off to the target’s home planet which of course is, you guessed it, Earth. This is a great storyline to start with because it’s simple, straightforward, and provides plenty of opportunity to show what Lobo is capable of (violently speaking) and keep readers engaged. The simplistic plot structure can easily be paired with memory recollections for further explanation about his past without creating an overtly complex introductory story arc. It also sets us up with a cool guest character as the target, who is currently unidentified. The issue ends with Lobo discovering the targets identity and stating his distaste for them with GPS circling what appears to be the Gulf of Mexico. Which character could this be a reference to and could they possibly be on the cover of issue #2? The cover for issue 2 hasn’t been released yet while number 3 has. The story does include some pretty great fight scenes which gives us a tease at the kind of things we can expect to see in future issues. The art is great and not just in the action sequences, which is essential for a comic like Lobo. The panels are bright and highly detailed while providing some gnarly carnage (Yeah, I said it. Gnarly). The artistic team also showcases they’re lighter side in the dream panels where they were able to make some truly beautiful pages. If you approach this as a fresh new comic featuring a brand new character, this comic is pretty good, but even then it doesn’t come without its flaws. Even without the comparison to the other Lobo, this character is too good-looking for a rough and tough bounty hunter. That’s not how things work. Assassins and spies are allowed to be attractive; bounty hunters look more like Dog (Dog…the bounty hunter). If this comic were realistic Lobo would have a cologne model gig and not have to go around decapitating people. The other problem I have with it is that the character’s personality is very similar to other DC characters personalities such as Jason Todd. As a reader of Red Hood and the Outlaws and now this, I don’t want two comics surrounding likeable bad boys who enjoy a good kill, but surprise you with a romantic side. Bunn needs to figure out how to distinguish this character and make it something truly unique — something the older Lobo didn’t have a problem with. So by viewing this comic independently and giving Bunn the benefit of the doubt of it being the first issue, I’m giving it a high score. Bottom line, it provides plenty of entertainment and great artwork and a lot of the problems may be solved over a larger sample size. I’d definitely recommend it and I’m excited for the next issue, but I’m looking for a little more from it next week.